Remove the adhesive backing from the LED strip. Apply the 2 sided tape to the back of the LED strip. Do not expose both sides of the tape yet, you will be doing a test fit first. Take off the glass and pull playfield out as far as possible to get access to the back of the backboard. Lay the strip out horizontally to check for fit. The LED strip should touch all the exposed wood on the back of the backboard. 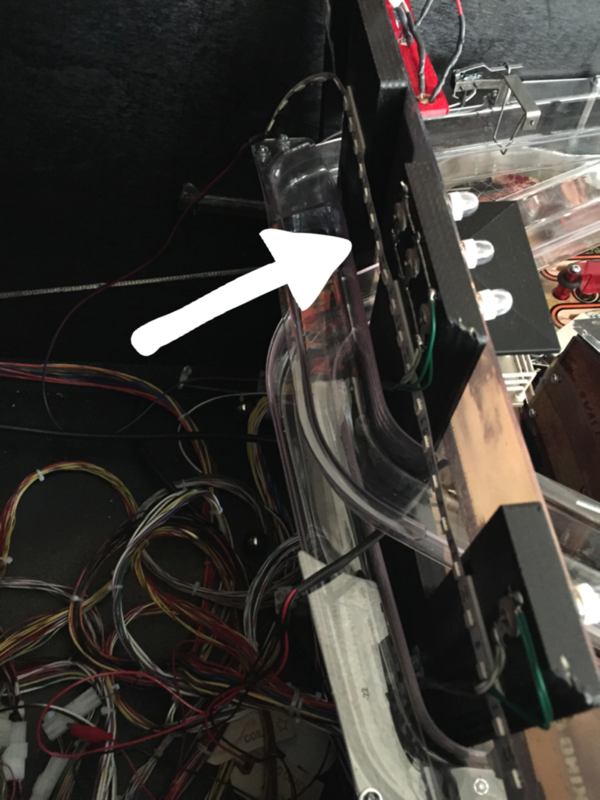 The LEDs should be installed as closely as possible to the top ramp plastic. The LEDs will also be installed underneath the wires going up the backboard. Remove the protective layer from the double sided tape. Remember to feed the strip under the wires on the backboard. Start on the right side. Firmly press the LED strip as you go from right to left. Run the connector to the coin door and plug in. Hi , the plug on the coin door (grey/red+ ,pink/yellow, black-) that fits my plug on the Ramp illumination reads about (grey/red13vdc) , but the polarity on the ramp illumination plug seems to be back to front ? Am I plugging it in the wrong plug ?